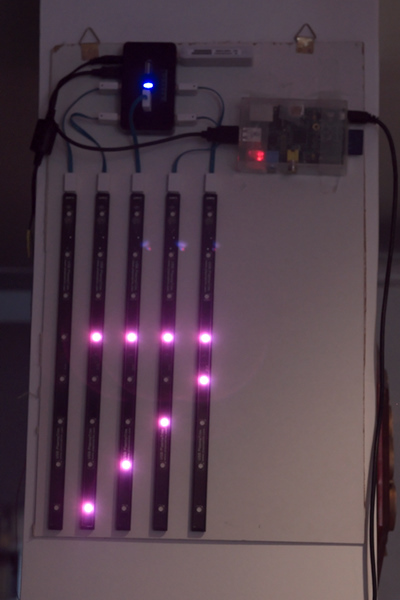 Server/library to combine the display of information and animations on a set of plasmatrims. allocate a rectangular region of the grid to a widget (for instance, digit, or simple unary bar). This will start the server, listening on TCP and stdin for commands. Where available, you can use the rlwrap program to get basic history and command editing. Typing 'help' will give you the list of available commands. If you are running on a raspberry pi, or are experienced freeze (caused by lost USB messages), run with DISABLE_READ=1 in your environment. In the console where ptrim-combiner is started. Don't type //-starting line, those are comments explaining what is going on. // COLOR can be 3,6,24 or 48 hex values. // Display the list of available widgets. // Set a wave animation on widget 1 at 20Hz. Color: RGB color value for 1 or multiple leds. For one led, color can be 1, 3, or 6 hex-bytes long (like F, 80, F0F, FF00FF). Region: A rectangular group of led possibly spawming multiple devices. Widget: Associated to a region, knows how to display some data. Layer: Widget data sets a per-led layer value (0=OFF, 1=ON). Then animation data fills all layers with color data. Singleshot: An animation that only sets the layer state once. Enabled when animation frequency is set to 0. Type "help\n" at the prompt. Each command ends with '\n'. Most commands do not cause any reply from the server. A server reply ends with '\n\n'. Simple 'bar' widget that displays data in 'unary' base, ie the value is the number of leds in the on state. The arguments are the widget boundaries. So widget value is between 0 and (1 + lastDev-fistDev) * (1+ lastLed - firstLed). A single digit from 0 to 9 displayed using 5x5 leds. Use rotate, swapx, swapy to rotate and mirror the displayed digit depending on your plasmatrims orientation. Use in singleshot mode only. maxV: r,g,b maximum value(hex no spaces). Apply dirchange algorithm when reached, per pixel. Propagation animation, at each step values are kept unchanged but moved around. Licensed under the terms of the Gnu Public License version 3. Reusing pieces from PlasmaTrim-CLI, https://github.com/cocide/PlasmaTrim-CLI, GPLv3.